In this post we use our previously created shard and start to segment our data by location. This is quite a common scenario. The idea is to split data by one of the properties. This will give us some insight into how sharding can be configured. Our goal is two locations (EU and US) with multiple shards, that as a sum will hold all the data. In this case we will simplify this example to only 2 shards each. Let's tackle this in details. Last time we finished at Shard Status info done with this command at router - mongos. I highly recommend to read more about data partitioning before you start to configure it. First thing that we need to create is Shard Tag, which is basically a name used internally to differentiate between chunks - parts of data moved between clusters by balancer. In our example, we will have simple location-based chunks. One for US location and one for EU location. Mapped 1:1 to an existing replica-set - rs1 and rs2. Now let's switch to database test and create a collection called sample with index on location and factoryId props. Next step is to enable sharding on the whole database and shard test.sample collection based on this index. Last thing is to start the balancing process. To test our sharding setup let's add some data to test.sample collection. Now we need to manually start balancer to move chunks into the right places. From mongos perspective all data in a collection are seen as one set. This is especially important from Write Concern perspective. More on that topic will appear in future posts. To confirm setup we need to confirm shard status. We can also check data on rs1 at mongo-1-1:27017 and rs2 at mongo-2-1:27017 to confirm, that at the end they landed on the right places. On GitHub at updated https://github.com/senssei/mongo-cluster-docker in queries directory, there is script init.js to automatically configure this for you. I hope that my post have helped you with mongo sharding. Stay tuned for more awesome content from this site. Feedback is always welcome. 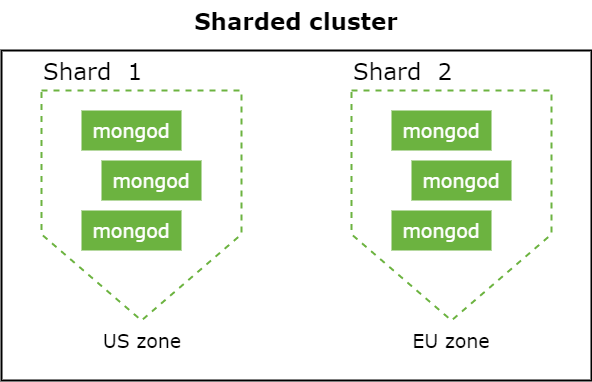 There are multiple web entries that touch this, but a comprehensive out-of-the-box setup of MongoDB shard is nowhere to be found. First of all, some of available materials are old and no longer applicable to the latest (4.0.1) MongoDB version.